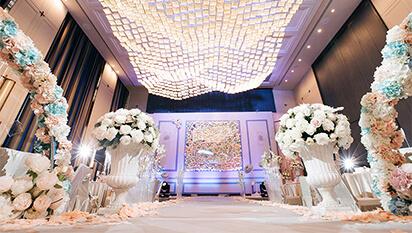 The ballroom and a further multi-function room are connected via a 680sqm outdoor garden, which makes an ideal venue for wedding celebrations, cocktail parties, and other social get togethers.The showpiece ‘Villa 18’ is located on the 18th floor, boasting an indoor area of 260sqm which opens out onto a further 680sqm open air garden. The villa comes furnished with a circular dining table that can accommodate 24 guests, a separate sofa space, tea area, and a mahjong facility overlooking the Qiantang River. In all, it’s the perfect setting to host small to medium-sized exclusive parties and gatherings.